Lies… there have been loads of them. And not all on the side of a bus. Banning bendy bananas… renaming Bombay Mix to make the snack politically correct… rolling out a one-size-fits-all “euro condom” – a certain section of the British press have shamelessly misrepresented the EU to invent the kind of myths that fueled the Brexit campaign. We reported this giant list of Euromyths last year. And now, with just 50 days left to avoid Britain leaving the EU in the messiest way possible, perhaps the most ridiculous Euromyth yet. Finishing off an important speech warning of a looming no deal Brexit nobody wants with all the economic damage and unneccessary suffering that would cause, the EU chief spoke for EU leaders at a loss at this stage with British politicians appearing hell-bent on allowing that to happen. 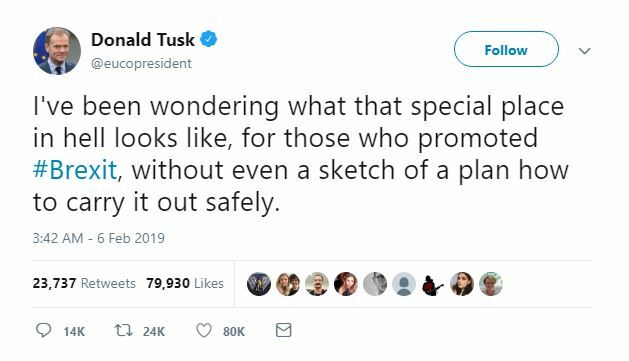 Tusk made a rather obvious point about the Brexit promoters who got us in this mess with no plan whatsoever as to how it would work. And with warnings that many jobs will be lost, people’s access to crucial medicines may be restricted and the nation’s health will suffer as fresh food and veg become scarcer with a no deal Brexit, suddenly Michael Gove’s assurance back in April 2016 that “the day after we vote to leave, we hold all the cards and we can choose the path we want,” doesn’t seem like much of a plan. Trade Secretary Dr Liam Fox’s “the Free Trade Agreement that we will do with the European Union should be one of the easiest in human history” doesn’t seem to ring true either. But instead of dealing with Donald Tusk’s point about the recklessness of pursuing this dangerous path for the UK “without even a sketch of a plan how to carry it out safely,” the usual suspects have chosen to misrepresent his words and feign outrage that someone on the continent would be so hurtful. 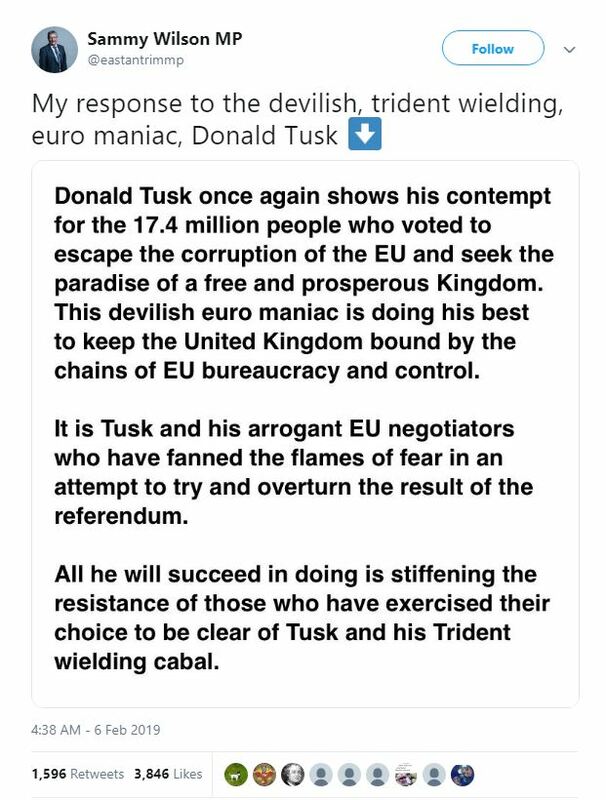 – And let’s not forget that Tusk’s measured words come after the likes of Boris Johnson have for years been rather more scurrilous about the EU, even likening it to Hitler in the Daily Telegraph. So the usual suspects’ reaction yesterday should be no surprise. DUP MP Sammy Wilson was one of the first out of the block to pretend that the “devilish, trident wielding, euro maniac, Donald Tusk” was referring to millions of Brits – rather than just numpties like him, who campaigned for Britain to leave the EU with no idea how that would work. 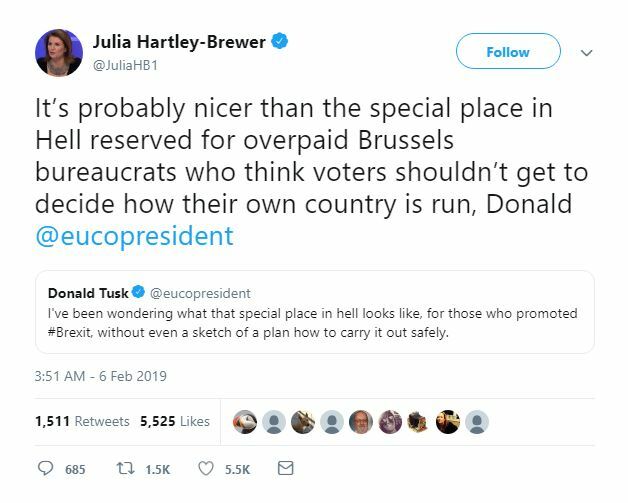 Julia Hartley-Brewer also chose to misinterpret Tusk’s comments as an attack on the British people, Brex-plaining: “It’s probably nicer than the special place in Hell reserved for overpaid Brussels bureaucrats who think voters shouldn’t get to decide how their own country is run, Donald”. “He is saying that 17.4 million people are stupid and got it wrong primarily because they are objecting to the system that he benefits from,” hard Brexiteer Jacob Rees-Mogg Brexplained in The Sun Online. “All it does it make voters say ‘thank Heavens we are leaving – they are so self absorbed’. “Sadly, Mr Tusk’s theology is not very good either – circles of hell are not reserved for people we disagree with. “They should go back to their Bible studies for another look- or perhaps I should send them the catechism to remind them of the teaching of Holy Mother Church,” added a more-holier-than-thou-than-usual Rees-Mogg. “When people throw insults around, it says more about them than the people they are insulting,” insisted Davis. Perhaps the most eye-watering response was Brexiteer Peter Bone reading out a misquote of Donald Tusk’s withering comment about his ilk in the House of Commons, demanding a beligerent response by the UK to the “completely outrageous insult”. Commons speaker John Bercow’s reaction to the Brex-planation was golden. “I was not hitherto conscious that the honourable gentleman the member for Wellingborough was notably sensitive, that he was in any sense a delicate flower, that he was capable of being a quickly and severely injured soul by the ad hominem remarks of others,” said the Speaker. Misrepresenting our negotiating partners in Europe to distract from the messy course your incompetence is taking Britain has got be the worst sort of gaslighting from Brexplainers. 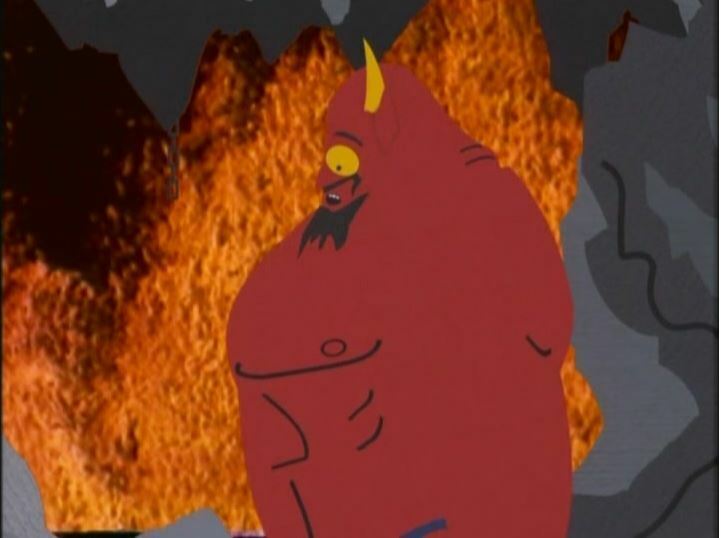 There really should be a special part of hell reserved for people who feign outrage at people who say that there should be a special part of hell reserved for those who endanger their country by promoting Brexit with not even the sort of plan you’d sketch out on a fag packet.